What are the best sewing machines for beginners? Here’s our opinions. First of all, we didn’t want to pick just one machine. We wanted to pick a couple different machines in a couple different price ranges. Some beginners want to spend less, yet some want to spend a little more to get a machine that will last longer and be more capable as their experience grows. Whichever category you fall into, we have a recommendation for each. If you want to spend under $100, which isn’t a bad idea if you have little experience with sewing machines, we feel that the Brother XL2600I is going to be the best option. This is not a very heavy-duty machine, but nothing really is in this price range. 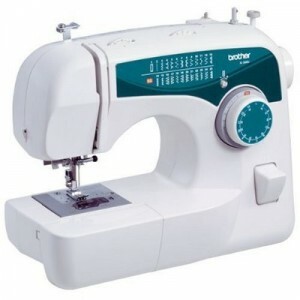 However, it offers a good stitch selection, features that make it easy to use, and many accessories that come with it. This is a great machine to use if you are learning how to sew or if you require a sewing machine but don’t have very heavy duty requirements. You won’t feel very limited by the features, in fact it might have more features than you need if you are a beginner. But as your experience grows you will be glad these features are available. Read our review of the the Brother XL2600I to learn more. We’re going to jump up to a quite a bit more expensive machine, this one can be had for just under $400 in many cases. What sewing machine are we talking about? The Janome 7330 Magnolia. Yep, $400 is a lot to spend as a beginner, but there is a good reason to look at spending a little more money if you are a beginner. Think about your interest in sewing – are you pretty serious about it? Do you have dreams of tackling larger sewing projects? Do you want a machine that you can learn with but also be able to use far into the future as your experience and sewing demands grow? If your answer is “yes” to any of those questions, you might want to invest a little more money into your first sewing machine. It’s quite possible to outgrow a budget machine quickly if you take a very strong interest in sewing. 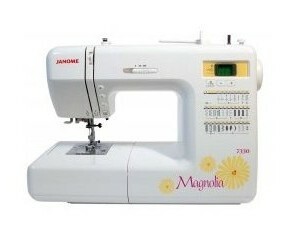 The Janome 7330 Magnolia is an excellent machine for beginners. It is easy to use and it offers very well thought out features. It’s powerful enough to stitch heavy fabrics. It’s reliable and won’t be a maintenance nightmare. It will be there for you as your grow in your sewing abilities. Read our review of the Janome 7330 Magnolia to learn more.